Facebook expected to reap the biggest rewards. Marketers are expected to spend more than a billion dollars advertising on social sites like Facebook, MySpace, LinkedIn and others, a recent study finds. In all, social sites will make $1.68 billion from advertising this year. That's a 20-percent increase compared to 2009, when companies spent $1.4 billion to place ads on social sites. Roughly half of the total, or $835 million, will go to Facebook, which reached 500 million users in June, the EMarketer study reports. Advertisers will spend about $323 million on MySpace—down from $445 million a year ago—$142 on social games and apps, and $383 on other social sites, according to the report. MySpace advertising is forecast to drop further in 2011, when experts say it will decline by 38 percent from 2009's numbers. By contrast, Facebook is expected to pick up steam and will reach $1.76 billion in advertising in 2011, a 112-percent increase compared to 2009, according to EMarketer. While Facebook's popularity is a factor in how much people will spend to advertise on the site, another draw is the ability for advertisers to create and post their own ads without a middleman. "[Facebook] has become one of the go-to places for marketers," says Debra Aho Williamson, a senior analyst with EMarketer. Are You Ready for Holiday Shoppers? Guess what? They're already here! 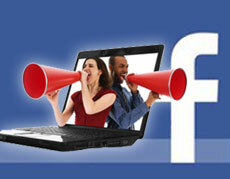 Link with Facebook allows friends to share recommendations, gift suggestions.